BEIJING -- Few things other than stories of victims rescued following China's most deadly earthquake in 32 years would touch the Chinese heart now. But the emotional Premier Wen Jiabao did. At www.tudou.com, China's YouTube-like site, a video titled "Dear Premier Wen, you moved China" is attracting hundreds of views. It's a compilation of scenes of Wen's visit to southwestern Sichuan Province, which was devastated by the most deadly earthquake in China since 1976. Wynlxl, the netizen producer of the video, wrote a caption: "Our dear Premier Wen, you had a long day." About two hours after the 7.8-magnitude earthquake jolted Wenchuan County in northwestern Sichuan, Wen was en route to the region by plane. 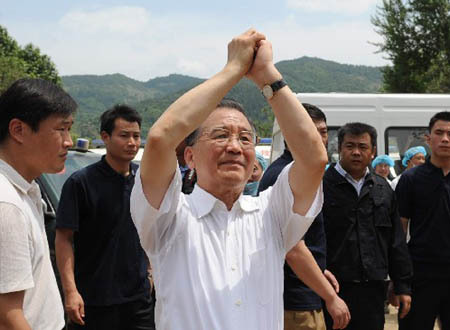 Within about 48 hours, he had paid whirlwind visits to almost all the worst-hit cities and towns including Dujiangyan, Deyang, Mianzhu, Mianyang, Beichuan and Wenchuan. On Wednesday afternoon, half a day after the first soldiers reached the epicenter town, Yingxiu, he landed there by helicopter. There were many moving moments widely discussed by ordinary Chinese. One was Wen caressing the cheek of a weeping girl in a factory, murmuring to her: "Don't cry. Food will be sent in a short time. Biscuits and milk powder will be sent, too." It touched many hearts. Audiences saw a tearful Wen on TV as well. 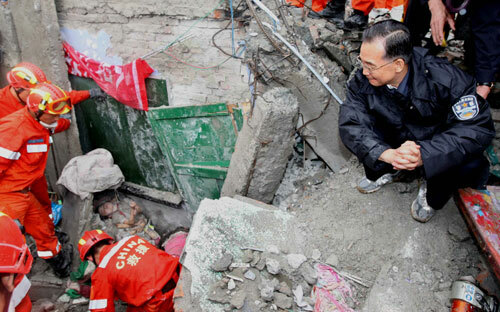 The premier wept as he watched rescuers try to get two children out of the shattered remains of a primary school in Dujiangyan.